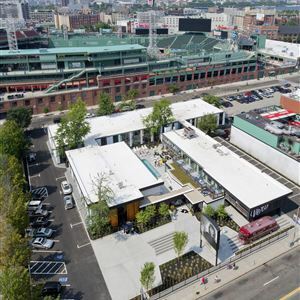 Property Location With a stay at The Verb Hotel in Boston (Fenway–Kenmore), you'll be minutes from Fenway Park and House of Blues Boston. This hotel is close to Boston Museum of Fine Arts and Hynes Convention Center. Rooms Make yourself at home in one of the 93 air-conditioned rooms featuring refrigerators and flat-screen televisions. Complimentary wireless Internet access keeps you connected, and cable programming is available for your entertainment. Private bathrooms with showers feature complimentary toiletries and hair dryers. Conveniences include phones, as well as safes and desks. Amenities Enjoy recreational amenities such as an outdoor pool and a fitness center. Additional amenities at this hotel include complimentary wireless Internet access, concierge services, and a picnic area. Dining Enjoy a satisfying meal at a restaurant serving guests of The Verb Hotel. Relax with your favorite drink at a bar/lounge or a poolside bar. A complimentary breakfast is included. Business, Other Amenities Featured amenities include complimentary newspapers in the lobby, dry cleaning/laundry services, and luggage storage. 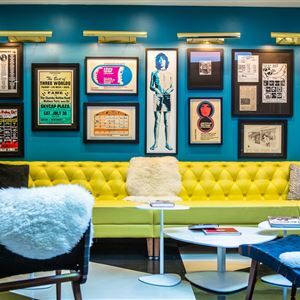 With a stay at The Verb Hotel in Boston (Fenway–Kenmore), you'll be minutes from Fenway Park and House of Blues Boston. This hotel is close to Boston Museum of Fine Arts and Hynes Convention Center. Make yourself at home in one of the 93 air-conditioned rooms featuring refrigerators and flat-screen televisions. Complimentary wireless Internet access keeps you connected, and cable programming is available for your entertainment. Private bathrooms with showers feature complimentary toiletries and hair dryers. Conveniences include phones, as well as safes and desks. Enjoy a satisfying meal at a restaurant serving guests of The Verb Hotel. Relax with your favorite drink at a bar/lounge or a poolside bar. A complimentary breakfast is included.